Do I Need an Authorized Rexnord Service Center? When faced with the choice of repairing or replacing critical equipment containing Rexnord components, many plant maintenance professionals ask the question: do I need an authorized Rexnord service center? 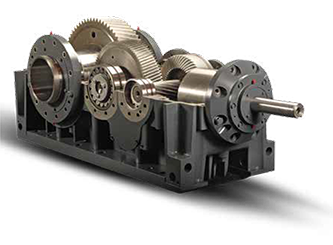 Rexnord is a manufacturer of engineered mechanical components including gears, drives, gear boxes, couplings, and bearings for a wide variety of industries. With the performance of such complicated and critical machinery at stake, it is important to trust your repairs to a team that has the know-how to do the repairs correctly, backed by an OEM after-market warranty. What is a Rexnord Service Center? Rexnord Service Centers are certified repair services for Rexnord parts. They have been certified by Rexnord to have the experience to identify issues with equipment, as well as repair them. Centers can handle a multitude of tasks for Rexnord and Falk products from maintenance and on-site repairs to rebuilds and storage. A few of the industries that utilize these services include mining, power/energy, paper, metal, aggregates, and agriculture. No-load spin and oil pressure test with filtration. New gearing is made to original OEM specification for material and tooth hardness in Falk and other manufacturers. Seals are replaced with original or better quality based materials. Bearings are replaced with only highest quality, Tier 1 bearings. Gearing is analyzed for cracks by using magnetic particle inspection. Ground gears and pinions are built to AGMA 13 standard or better. Gear reducer exterior are repainted to original color or customer specification. Housings are chemically dipped to prevent future failures caused by any lubricant debris. Long-term storage preparation on all units. 12 to 36 month OEM warranty on after-market solutions. Rexnord gear box repair services here at HDS carry the above standard Rexnord warranties, all while providing local convenient service. This provides additional service choices for customers in Oklahoma and Texas, with the assurance of OEM-quality repairs and Rexnord Authentic Falk Gear Parts. Make your drive better than ever – we don’t believe any gear drive should be considered obsolete just because it’s no longer manufactured. Call us today to discuss your requirements! 24 Hour Service to Meet Your Needs. HDS has a modern rotating equipment repair service center, strategically located in southeast Houston and capable of handling all your repair and rebuild needs. We can turn up to 100" in diameter and 30' in length. Dynamic rotor balancing is accomplished with state of the art large capacity Schenck balancing equipment and trained personnel. Local flexibility allows us to work with your personnel and your schedules - 24 hours a day - 7 days a week. Whether a large or small repair requirement, HDS will have your equipment back in operation with a minimum of downtime. © Houston Dynamic Service. All rights reserved. Internet Marketing by Marketects.